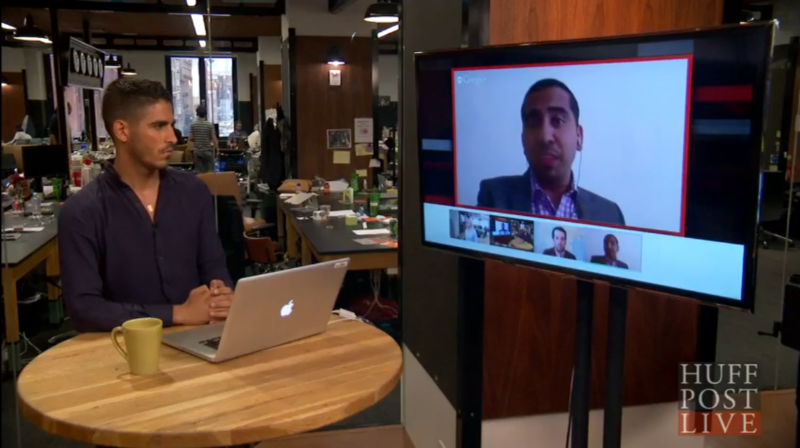 HuffPost Live Host Ahmed Shihab-Eldin speaking with Mehdi Hasan, political director of HuffPost U.K.
HuffPost Live, the Huffington Post’s live-streaming network, is adding a new editorial element — called The WorldPost — in a bid to dramatically expand its global coverage. To do so, it has struck a partnership with the Berggruen Institute, a non-partisan “think and action tank” founded by Nicholas Berggruen. Google’s executive chairman Eric Schmidt, who is part of the think tank, will join the editorial board of the WorldPost. Among some of the global features, as described by HuffPost: “Global Gay Voices,” about what it’s like to be gay in different parts of the world; “The Third Metric Around the World,” about how people are looking at success beyond the two metrics of money and power to include well-being, wisdom and giving back; and “Your 15 Seconds,” which will focus on the creators of the day’s/week’s top international Vine and Instagram videos. WorldPost’s editor will be Nathan Gardels. Peter Goodman, the HuffPost’s executive business editor, will also expand his portfolio as the WorldPost’s global news editor. “Rooted in a global perspective that crosses all boundaries, it will be connect-the-dots news and analysis covering everything from politics and culture to lifestyle and entertainment,” said Berggruen, whose institute will be providing funding for stringers worldwide and other programming. The HuffPost declined to say how much that will be, but it is over $1 million. AOL has put a lot of resources into HuffPost Live, in an aggressive bid to expand its video offerings and to garner those fast-growing revenues.